Israeli soldiers abducted, overnight until morning hours Tuesday, twenty-four Palestinians, from their homes in several parts of the occupied West Bank, the Palestinian Prisoners Society (PPS) has reported. The soldiers invaded and violently searched dozens of homes in various parts of the West Bank, and interrogated many Palestinians while inspecting their ID cards, before abducting the twenty-four residents. The Nablus office of the PPS, in northern West Bank, said the soldiers abducted Mohammad Keewan, Sobhi Keewan, Ghazi Sha’er, Amro Shehada, Zohdi Theeb Qawareeq, Nasseer Abu Thabet, and Abada Nizar al-Jamal. The Palestinians were taken from their homes in Nablus city, in addition to the towns of Awarta, ‘Asira ash-Shamaliya and Beit Dajan. The army also summoned for interrogation, a former political prisoner, identified as Samir Salim Sharab, from Awarta. In Bethlehem governorate, the soldiers invaded Beit Sahour city, in addition to Doha and al-Khader towns, and fired many gas bombs and concussion grenades, during ensuing protests. The soldiers also abducted Mohammad Fayez Salhab, 18, from his home in the al-Karkafa area, in Bethlehem. 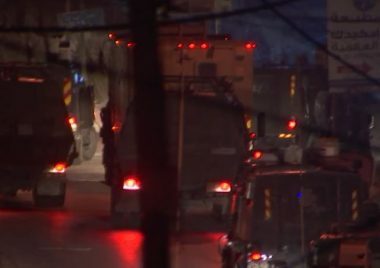 In Hebron city, in southern West Bank, the soldiers abducted Mohammad Abdul-Athim Abu Turki, 34, Jawad Shafiq Abu Aisha, Ibrahim Zeidan Rajabi, and Salim Rajabi. Another Palestinian, identified as Mahmoud Abdul-Afo al-Emla, was taken prisoner from his home in Beit Ola town, northwest of Hebron. Furthermore, the soldiers abducted two former political prisoners, identified as Abdul-Nasser Nasser Abu Maria, 20, and Qussai Ahmad Abu Hashem, 18, in addition to Amro Arafat Za’aqeeq, 16, and Majdi Mirshid Awad, 14, all from Beit Ummar town, north of Hebron, before moving them to Karmie Tzur illegal colony, south of the town. In Tubas, in northeastern West Bank, the soldiers abducted Yousef Walweel and Zakariya Oleyyan, from their homes in the al-Far’a refugee camp, south of the city. In Salfit, in central West Bank, the soldiers abducted a young woman, identified as Tha’era Mousa Qassoul, 24, at the entrance of the nearby Kifl Hares town, while she was on her way to work. In occupied Jerusalem, the soldiers abducted four Palestinians, identified as Tha’er Abu Khalil, Jaber Ahmad Salaheddin, ‘Assem Nassif Sa’id and Abdul-Rahman Osama Khatib, from their homes in Hizma town, northeast of the city. In Ramallah, in central West Bank, the soldiers abducted Mohammad Fawzi Shalabi, from his home in the al-Mazra’a ash-Sharqiya town, northeast of the city. It is worth mentioning that the soldiers killed a mentally disabled man, identified as Husam Abdul-Latif Habali, 22, and injured several others, in Tulkarem city, in northern West Bank.